When American experts decide to volunteer with Farmer-to-Farmer, they need to know that they will be taken care of in an unfamiliar nation. Knowing that everyday details have been taken care of, a volunteer can quickly acclimate and get to work. In Nepal, Winrock has a small, but dedicated and highly experienced team committed to supporting a volunteer before, during, and after his or her placement so that the volunteer can focus on the most important aspects of the visit: imparting as much information as possible to project beneficiaries. Winrock employees Amar Thing and Ajaya Bajracharya lead the effort to welcome volunteers and coordinate their efforts. They understand the challenges of traveling in Nepal’s many remote agricultural areas with visiting foreign guests. Just as important, both are seasoned agricultural professionals who possess the broad range of technological abilities needed to translate instruction in a way that local learners will understand. Both are fluent in English, Nepali, and a handful of other local languages. When the volunteer touches down, the details, including lodging, food, itinerary, and contacts have been taken care of. The volunteer can immediately get down to work. (That’s not to say complications don’t emerge. But when they do, Amar and Ajaya have the experience to nimbly respond.) At the close of the volunteer’s engagement, Amar and Ajaya help him or her prepare an end of assignment report. Not only does this document justify the resources USAID has spent on the placement, it also recommends metrics to evaluate outcomes and suggests areas for future work. The Winrock-Nepal team always incorporates volunteer placements in larger projects underway throughout the country. Because of the unquestioned value added by volunteers, Amar and Ajaya do all they can to keep a stream of American volunteers coming to Nepal by supporting those volunteers from the moment they set foot in Kathmandu. A suite at the Marriott and drive-thru hamburgers may not be in the cards for a Winrock Farmer-to-Farmer volunteer in Nepal, but a visiting American couldn’t ask to be in better hands. I had a wonderful experience in Mali on account of all of your support, excellent relationships established the host communities. I was so comfortable in Mali due to the fact that everyone we met and worked with was very kind, welcoming, and accommodating. I learned a lot from seeing the way that people live in Mali, especially the agroforestry used prevalently, the tight communities that villagers live in, traditional architecture, and beautiful art and music. I was pretty amazed since I hadn’t really told them anything like that directly but what they wrote pretty much described what I thought we were trying to do too. Interesting with the language barrier and all. 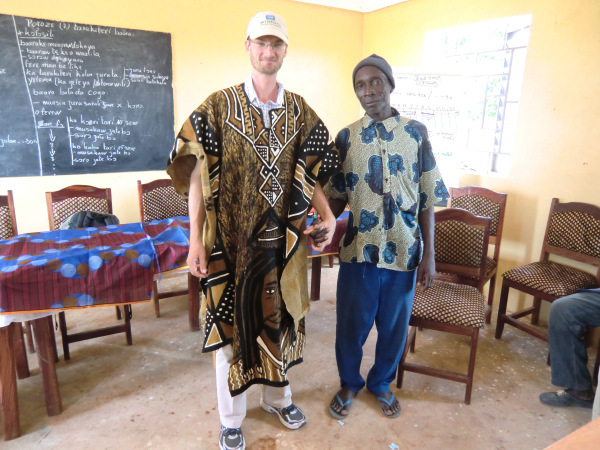 The M’pendougou community gave me a beautiful traditional robe as a parting gift, and the name ‘Kunje Senougou,’ which means ‘old road’ (as in the long-time relationship between Mali and U.S. –they had hosted a number of Peace Corps volunteers previously) in the initial meeting with them. 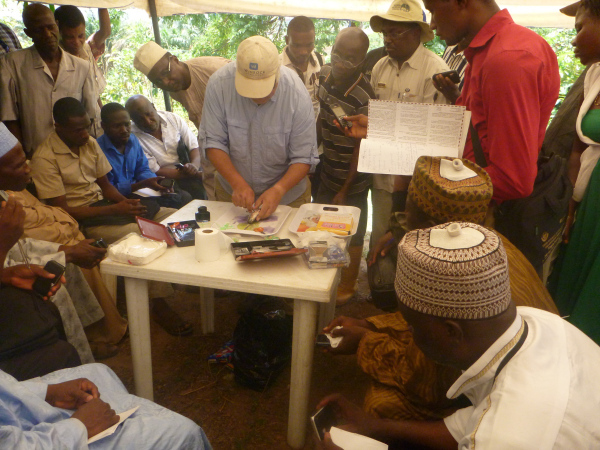 This is the kind of cultural exchange that makes Farmer-to-Farmer such a valuable program. Beyond just a technical exchange and training opportunity, this program builds connections and bonds that are impressionable for both sides. “Personally, this was a great experience for me. 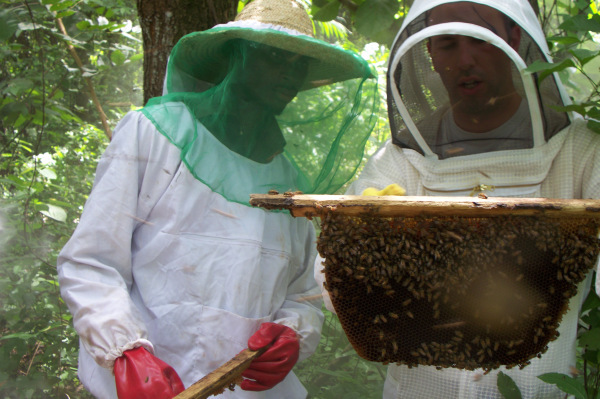 The cultural immersion that took place over the past two weeks has opened my eyes to the situations Nigerian beekeepers and the residents as a whole face on a daily basis. Spending time with students, staff and others has shed light on the circumstances they face with their families and how they overcome difficulties. Joe Sullivan (who has volunteered six times with Winrock’s Farmer-to-Farmer program) wrote a response so poignant, it deserved its own blog entry. Thank you, Joe, and Happy 4th of July! “Because it is right” –What better reason can there be? But America’s gift does not come without a cost. Freedom is not free nor is there a way out of poverty without effort. Americans go overseas in the Farmer-to-Farmer program and in Peace Corps to teach people how to help themselves, to give them a hand up, not a hand out, to lift themselves out. Not everyone has two years they can commit to meeting the world where they live and teaching them how to help themselves as a Peace Corps volunteer. But sooner or later, almost every US citizen has a few weeks to a month to bring knowledge or to teach a skill to a citizen of the world so that together, as Kennedy said, we will bring about God’s work on earth. There is not anything I would rather be doing than this with my brothers and sisters whom I have met and have yet to meet around the world. In honor of the upcoming 4th of July holiday, we cannot help but reflect on the symbolism of this important day. All of us here at Winrock are very proud to support such great American volunteers in their quest to help others and participate in people-to-people exchanges that can forever change who they are as individuals, as US citizens, and as citizens of the world. What better way is there to celebrate and embody freedom, patriotism, and service than by helping those who have less than we do? We thank all of our volunteers for so much heart and dedication!